And so begins the blog writing process of 2017, as I sit here in my Istanbul apartment admiring the snow pouring past my windows, and I thank each and every snowflake for ensuring that today was a snow day and school was cancelled. Ironically, I'll be writing today about Portugal, a place not blanketed in whiteness, but booming with colour, perhaps more than any other country on the European continent. One day, hopefully soon, I'll set out to write about Lisbon and Porto and all the places we visited in between, but today will be focused on Sintra. If, as I previously mentioned, Portugal is a place beaming with colour, then it's hard to imagine that Sintra wouldn't be the epicentre of that colour. While I can't speak for the entirety of the country and say that with certainty, I can certainly say that a place like the Palácio da Pena (Pena Palace) is one of the most grandiose and colourful buildings I've seen in my life, so that's worth something. We visited Sintra with two pals from Istanbul who we also happen to work with, Catherine and Joel, and, suffice to say, I think we did a good job of tackling Sintra in our day-trip from Lisbon. 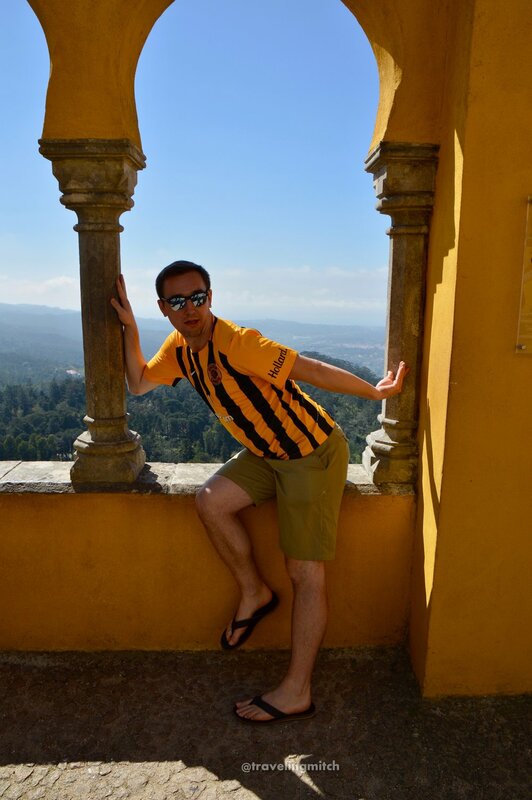 As a matter of advice, I would say that Sintra can be done in a day if you head there early and expect to come home late, but spending two days and one night there would perhaps be more manageable. What we did worked for us, so let's cut the chitter chatter and get to what we actually saw in a day, which I'm only too excited to reflect upon. 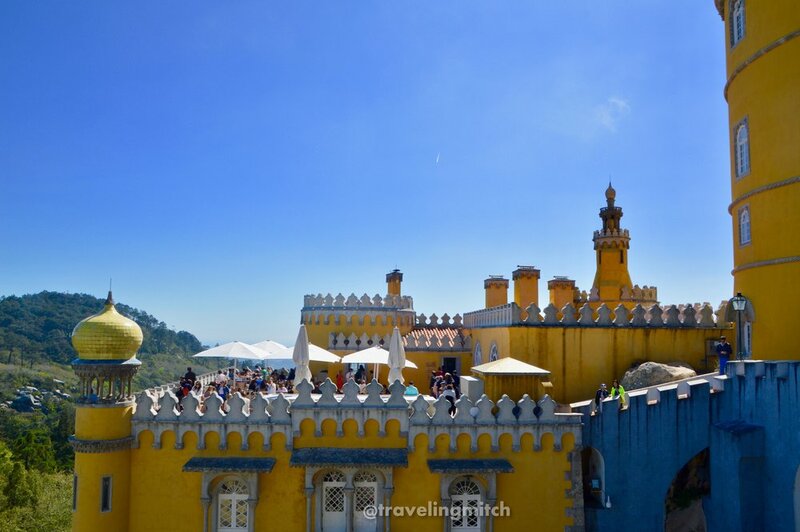 Sintra is a romantic and historically significant town if I ever saw one. It feels an awful lot like the model Disney World would use if they were trying to re-create European splendour. People often mention that a place is like a "walking museum," but this was another level. 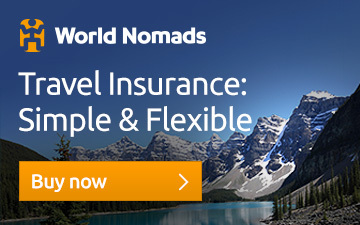 Sintra itself proposes a three day itinerary which is jam-packed and rightfully so. As I previously mentioned, for one full day, I feel like we did a good number on the place, though I wouldn't say no if anybody wanted to go back with me, I'll tell you that much. This estate is what I would own if my bank account was overflowing with money and my brain was overflowing with creativity. The grounds of the Quinta da Regaliera feature a chapel, a gorgeous palace, immaculate gardens, bizarre underground tunnels, a plethora of buildings, lakes, wells and everything in between. The estate was initially owned by royalty, but it was sold in the late 19th century to an eccentric man named Antonio Augusto Carvalho Monteiro, who, with the help of an architect, transformed the place into his own personal playground. As legend tells it, he wanted the place to represent his interests, hobbies and obsessions, and that's what makes the place such an interesting place to explore. This Monteiro fellow has left his fingerprint on nearly everything, seemingly for the better. After spending some quality time at Quinta de Regaliera, we took a much needed break. It's exhausting, you know, viewing quirky Portuguese mansions and gardens. We sauntered back into the center of town and popped our head into a little hole-in-the-wall restaurant that looked like a glorified basement. Which, as it were, was precisely what Joel, Catherine, Bri and I were looking for. As we all lived in Turkey, our primary goal was to order something with pork in it, as well as get a good quality beer. 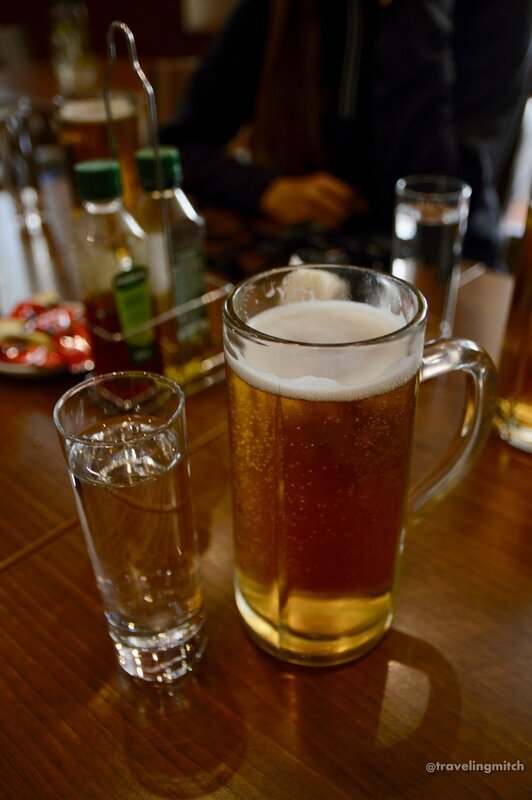 That we did, as we enjoyed a cold one, along with a Francesinha, which is a sort of Portuguese "wet sandwich." Then, we took off towards the Pena Palace in an old, purple Volkswagen Beetle - as you do. Most who know me, know that I'm a fervent Redditor. This sort of palace/castle, in my opinion, belongs on the subreddit, Imaginary Castles. Except, this place is indeed very real. As this romantic castle sits atop the hill overlooking the town of Sintra, I tend to think of this place as the real "face" of Sintra. 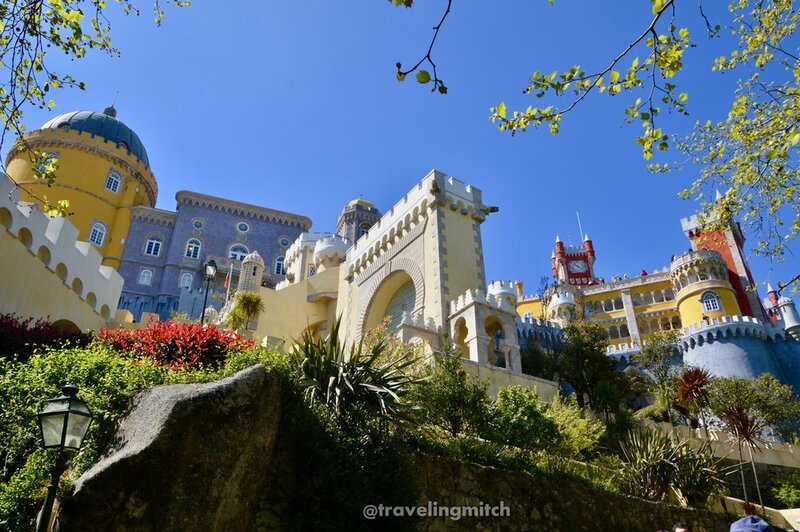 That is to say, If you were to send postcard home to mom and dad, you might look for one with the Pena Palace on it. It's surreal, it's absurd, and it's downright magnificent. I'm told that on a clear day, you can see this beauty all the way from Lisbon, and I believe it. I referred to this castle as a "romantic castle" before very intentionally. It's known worldwide as one of the great expressions of romanticism to come out of the 19th century. For me, it's some mixture of mind-boggling and fantastic. It looks equal parts kid's theme-park/unbelievable state palace. I mean absolutely no disrespect by that by the way, it's just that as you're walking around, sometimes you look up and you're like..."What the *insert favourite expletive*?" In all seriousness, we were totally enamoured with the place, and we basked in its colourful presence for quite some time, even indulging in a little photo shoot of sorts in the back courtyard. Some got more scandalous with the photo shoot than others - not mentioning any names. It's very easy as a travel blogger to make comments like "oh my god, I'd never seen anything like it!" and so on and so forth. But this is one of those sights where I did actually feel like I was in the presence of something deeply unique. You just know the Castle of the Moors is going to be epic before you even get there, right? Just so you're aware, I didn't wait for you to answer that question because I was so sure of the answer, and, well, because I've been there. You can actually see the Castelo dos Mouros from several viewpoints at Pena Palace. That's what makes Sintra so unbelievable, the fact that all these great sights are in such close proximity. This particular castle was built by, you guessed it - The Moors! Its beginning dates all the way back to the 8th century, which, as you know, is a fair bit of time ago. In the present day, I would guess that they built it there for the endearing view of the surrounding landscapes, but, of course, it must have actually been constructed, historically speaking, because of its great visibility and its defensible position. It was of strategic importance for centuries after it was built, and today it continues to be of importance historically, itself being a UNESCO World Heritage Sight. Though, I should note, it seem like everything within a 25 km radius of Sintra pretty much has the nod from the folks at UNESCO. Anyway, why don't you take a peak for yourself? Hey, welcome to 2017 with a new website, and plenty of fresh content on the way. As always, thanks for stopping by. 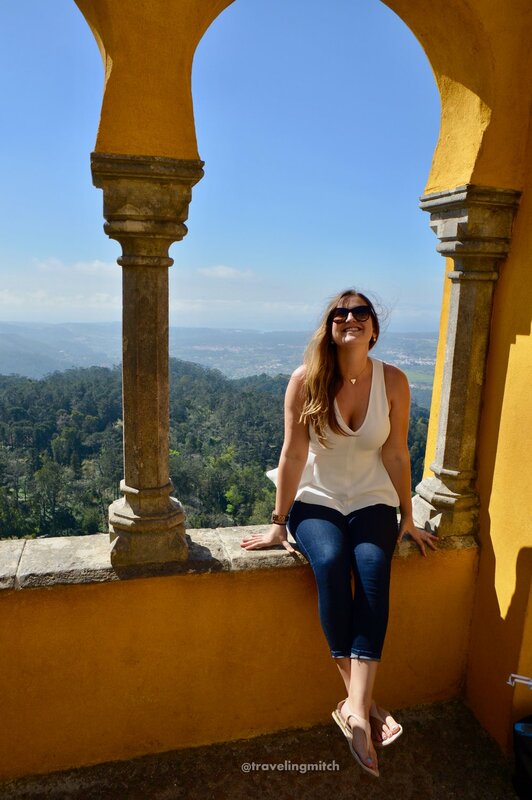 By the way, if you're in Sintra, it's not unusual that you'd be spending time in Lisbon as well, feel free to check out this Lisbon in 72 hours guide!